The Q10 editor is a full-screen editor that can be a great tool for writing -- particularly for writing your first drafts without distractions. It is free, tiny, and runs on Windows or under Wine (Windows emulation on other operating systems, like Linux).1 It's small enough that you can fit the application and your documents on a USB stick. It's easy to use, and everything is located in one simple help menu, accessed with . 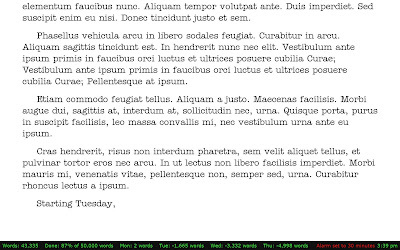 The typewriter look and feel is one of the things that attracts writers to this application. The default settings it comes with include a typewriter sound effects from the Amélie movie (for both keystrokes and carriage returns), and the default font is courier -- the classic, mono-spaced font. The settings offer plenty of flexibility and you can set them to match your own preferences. With the customizable colour palette, you can set your colour combination to white text on a black background, black text on a white background, yellow on black, or anything in-between. You can also choose whatever font you like and alternate sound schemes, or turn the sound off completely. Q10 is available in multiple languages, with or without the spell checker. As an added bonus, it gives you current statistics including your ever-changing word count (as well as characters and pages). There is a easy-to-set alarm2 for writing sessions and word wars. Or, for word count goals, you can set the global target and Q10 will keep you updated as to what percentage of that goal you have achieved so far. There are also four partial counts that you can use for your own purposes, setting them to whatever quantity and units you need (words, pages, lines, paragraphs, characters or non-spaces). To do this, you'd set your Global Target to 50,000 (Ctrl+T). Then set up the counters in your preferences (Ctrl+P) for Mon, Tue, Wed, Thu. Then set the counters to the number goals using Ctrl plus the number. 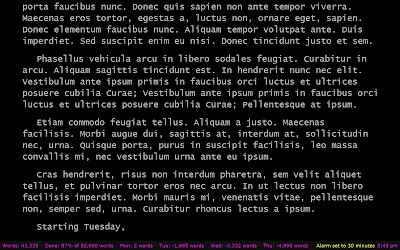 E.g., for Monday, press Ctrl+1 twice, then enter 45,333 words (Twice, because the first instance sets the partial count to your current location). Q10 provides bookmark functionality through the use of Notes -- any lines starting with ".." are considered notes. Using Ctrl+H invokes the "Notes list", and you can quickly jump to your note locations throughout the document. 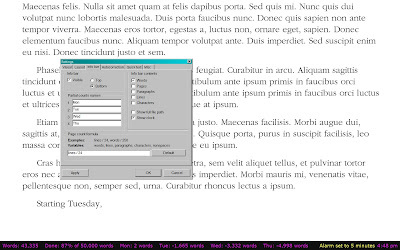 These lines are not included in the final word count, so those who want to make sure their chapter headings are not included in the final word count, can do so by utilizing this feature. One more tip -- Q10 can be set to open the last document by default when it starts up. Once you've got more than one document though, you may want to set up a file association for your Q10 files. Rather than use .txt as the extension, you can an extension such as .q10 (so long as this doesn't clash with anything else on your computer). This way, your existing TXT text files can still open up with the existing editor they are set to (such as Notepad or Wordpad), but your new writing files will open up with Q10. 2 Caution: The only crash experienced in testing this application was when the alarm was on. You might want to check out the "auto save" feature before this one. There is for Linux and Windows similar to Q10. It is written with Qt4. So I guess it can be ported to Macs too. Do you like the new template?